Somehow I wasn’t drunk last night and still ended up at Dennys. I am on track to have my beer list finished on New Years Eve. I’m kind of sad about that. My easy post material on Thursdays will have dried up also. That is okay though, I have some cool beer history and such that I’d like to share. Beers 108-111 are all interesting to pronounce, which is probably why I hadn’t ordered them yet. 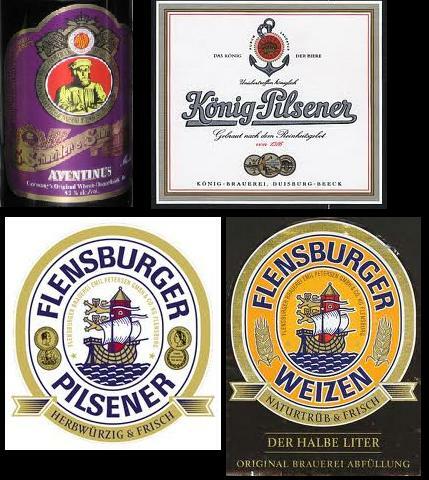 Aventinus, Flensburger Weizen, Flensburger Pilsner, and Konig Pilsner. The Aventinus has a pretty decent ABV, somewhere in the 8s, so that was a nice start. The alcohol didn’t come through on the taste but it still was not something I’d really go back to. How about some booze for breakfast? Check out the video above. I’ve been showing this thing off to everyone I can get to watch it. I’ve been a big fan of the bacon lattice for a long time, I even made a bacon taco the other day, but these guys are on a whole other level. One day I will make that battered, bacon wrapped ham. Who am I kidding, I’ll probably make the stuffed pancakes at some point too.